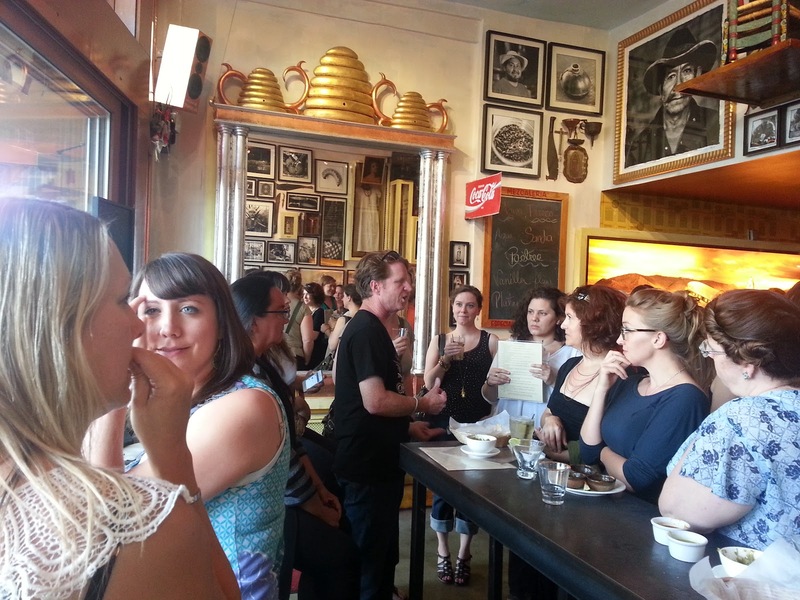 A beautiful early August evening found a steady stream of women pouring into Queen Anne, headed for Mezcaleria Oaxaca to learn about agave. Mezcal is a much maligned, misunderstood liquor. Many mistake it for that awful bottle of vacation rotgut with a worm in it. But as we learned, mezcal is so much more. Mezcal is any liquor made from a species of the agave plant, so technically all Tequila is mezcal. The agave plant is trimmed, resulting in a heart called the piña, which is roasted for several days, often over a smoky fire which leaves a distinctive flavor in the final distillate. After roasting, the piñas are crushed, traditionally by large rolling stones pulled by donkeys. The extruded juice is then introduced to yeast and the result is distilled. Mezcal purists prefer to drink their liquor unaged, believing that aging can hide the aspects of the drink they most enjoy. We tried the Del Maguey Vida, twice distilled from espadin. Like many mezcals, Vida is distilled to proof, meaning it's bottled at the proof it comes off the still, instead of being diluted with water. This means more of the original taste of the source product remains. The best mezcals are earthy, still hinting of the sweetness of the agave, and smoky from the roasting process. The Vida was soft, sweet, and had a nice astringency at the end. We also tried the Pierde Almas Dobadaan, which is made from a rarer form of agave. It had lots of pepper and earthy spice to it I quite enjoyed. While some may disapprove, aging mezcal can add a smoothness and sophistication that's very enjoyable. We tried Ilegal Reposado, also made from espadin, which had a lovely buttery flavor. The Mezcaleria Oaxaca happily serves its mezcal in traditional copas, made of either ceramic or out of a gourd and beautifully carved. It took a lot of willpower to prevent one of those works of art from finding its way into my purse. Speaking of works of art, the Mezcaleria features the photography of Spike Mafford, who was on hand to extoll the virtues of his favorite liquor and celebrate his birthday. As a treat, he "raffled" off a print of the airplane photograph that dominates the restaurant's bar. As he gave us all the same raffle number, he solved the problem by tearing the photo into smaller pieces and autographing each one. 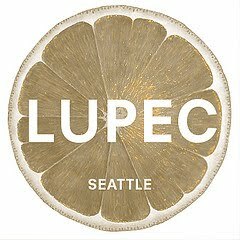 As a group, LUPEC Seattle now shares in a beautiful photograph. In addition to an extensive and ever growing list of mezcals to taste, several cocktails were also on offer. I quite enjoyed the Primer Beso, which features pineapple infused mezcal, triple sec, orange juice, and a gusano salt rim. It was well balanced and still let the mezcal sing through. Plenty of delicious bites from the kitchen, sister to La Carta de Oaxaca in Ballard, were also on offer. I can't wait to go back and have a full dinner. A huge thanks to the owners of Mezcaleria Oaxaca for hosting us and providing us with an education on this wonderful spirit.